Be it summer, spring or autumn, tissues are must in skin care routine. Specially in summers when sweating is maximum, these facial tissues and skin refreshing wipes are our best friend while travel. Wet wipes work great in summers, because along with taking of the sweat, they also protect us from sunburn through their refreshing cooling sensation. Like wet wipes work great in summer care routine, simple facial tissues work great for moderate climate along with giving other multiple uses like face cleansing, wiping etc. today I am here with the Mist Facial Tissues and here is the review on it. 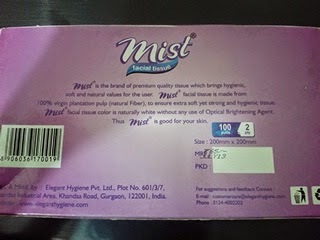 Mist is the brand of premium quality tissue which brings hygienic, soft and natural values for the user. Mist facial tissue is made from 100% virgin plantation pulp (natural fiber), to ensure extra soft yet strong and hygienic tissue. 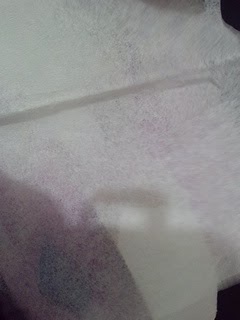 The tissue color is naturally white without any use of Optica Brightening Agent. Thus Mist is good for your skin. Price - Rs 65/- for 100 pulls 2 ply. These Mist facial tissue comes is a simple tissue pull box in pink purple shade with a small section top pull tissues. The box is really light and of very fine quality. Now coming to the tissue, they are of normal size in square shape but extremely thin than one could easily see the traces of hand beneath. When you hold the wipes in hand, you could feel their extremely thin texture. However on use, these work quite nice while using them for face cleansing, using them toners or even as wipes in case of wiping sweat. They do get rolled up quickly because of being so thin, but normally serves the purpose. I use these for multiple things like cleansing, toning, wiping hands and other body if required and even use these as cotton balls with nail polish remover sometimes, when I am out of stock of the cotton.In this case I do face little problem, since these are very thin but something is better than nothing. I always carry a tissue bag with me and also keep one at home. The one I carry is normally in zip lock form but this one in box shade is more convenient for home use. Just keep these on you table and these are ready to go. Just pull these and you are done. I always use tissues for several things and would keep using these in different brands. 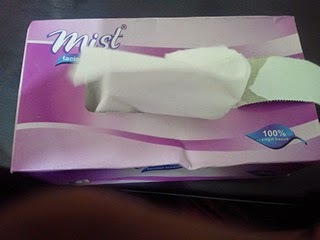 I would buy this Mist tissues brand again but in some other variant. Comes in convenient pull box. Does its role of cleaning and other things perfectly.